Stable and at the same time very easy-going, however, apply the body weight / a little leg muscles to get the most fun out of this highly skilled ski. Had a couple of really good pistachios with 2 meters longer radius before but experience Supershapen as both stable and flexible for long as well as short turns. 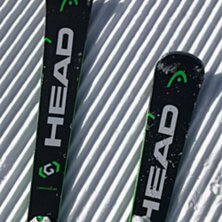 Summary of this: In piste rides, this is very nice skis, very good grip, good speed and stability in the carvingen, and works well to slap a bit in the back of the ridge. Forest (Not my strong side) Well, I'll skate it with these skis next time .. Loose snow. Works, but there are definitely better skis to use even there. Wanted good stable pistons and got terribly good teams that were beyond my expectation. The ski has a very good ice grip. The ski is a bit heavier than other skis, so it has a huge speed stability. I'm 190cm and my skis are 170cm. It has awesome fun slalom features but also goes like a grand slalom. It has a relatively wide waist that makes it possible to cushions but it is not designed for that purpose. It's not very good at pillows but otherwise it's a wonderful ski. Awesome nice skiing. The most fun I have traveled on. While I tried and bought this ski, I also tried the Rossignol Zenith Z9 oversize which was very nice to ride on. It has a larger radius and a slightly wider waist so it did not really fit my ride style but incredibly speed-stable and good even in pillows. Should be moving then. Do you just want to go fast, buy a wig's tigershark. It goes away! A really fun skiing! You do not have to be heavy or go with a lot of power to maneuver the skid, it's good technique. Going SCoTT, takes part. Is one of the worse in my class? Many go on this ski, and regardless of the length, weight and experience of the skier, everyone is super pleased. We go the most, and the ski is all about it. I'm going on a long model, and it's reliable in short-range, between turns and big turns. It's speed-resistant and bites really well on ice. Have only ground 90 degrees, no more needed! In summary, I am ill satisfied and look forward to the winter's ride!